Mini PCs are all the rage in the current time due to their portability and efficiency. HP has also launched something similar along with their Pavillion Wave series of desktops. 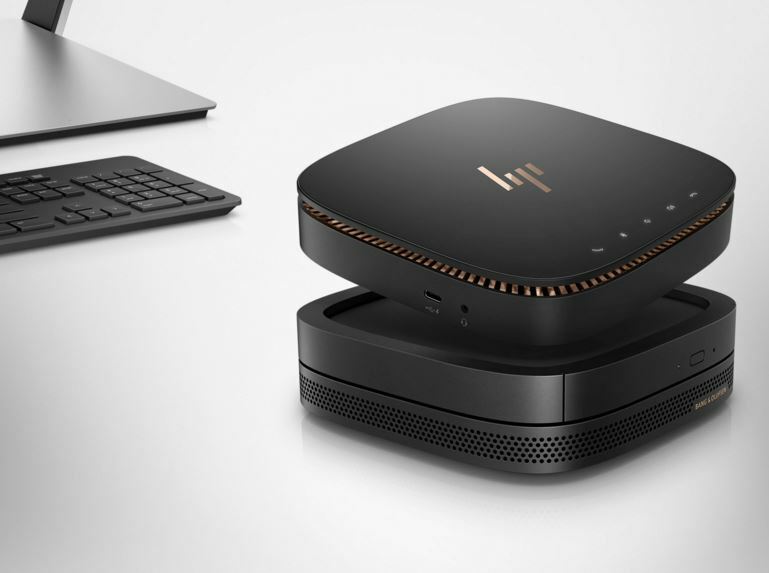 HP has also jumped into the mini PC market with the HP Elite Slice but there is something special about this new mini PC. It is a modular PC which allows customers to choose the parts on this PC and build a system that works great for them. It provides a new cable-less connectivity option to the consumers which can help you in having your workplace polished and free of clutter. The Elite Slice does this by providing the snap-on parts that will help you add new functionality to the PC. You can choose to go with options that will add more functionality like an Audio Module, Optical Disk Drive module, Wireless charging cover and more. This is one of the first mini modular PCs that will draw power from a connected display using a USB 3.1 Type-C cable from a display that also has a Type-C connector. You can also choose to have a new Quad HD EliteDisplay from HP which will come with wireless charging and USB type-C ports. HP Collaboration Cover for converting your desktop into a Skype for Business phone. HP Wireless Charging Cover for eliminating the cables to charge the mobiles as well as devices to keep them powered. HP Audio Module that will help the virtual meetings and their audio crisp with the Bang & Olufsen 360 degrees speaker design. There are two microphones as well that will take advantage of the HP’s noise cancellation software. HP Optical Disk Drive module for reading and backing up files to and from CD and DVD drives. Other important features include the fingerprint sensor what will take advantage of Windows Hello for security along with the SP Sure Start that will provide BIOS-level protection to users. The device is powered by a powerful Intel Core i7 that will only need 35W to perform. You get all the basic things like an Ethernet port, Wi-Fi, HDMI and DisplayPort to power external displays. The HP Elite Slice will start at a price tag of $699 and the other accessories and modules will cost extra. The HP EliteDisplay S24ouj display will start at $429 and the HP Audio Module is available at $109 and the HP ODD Module will be available for $99. 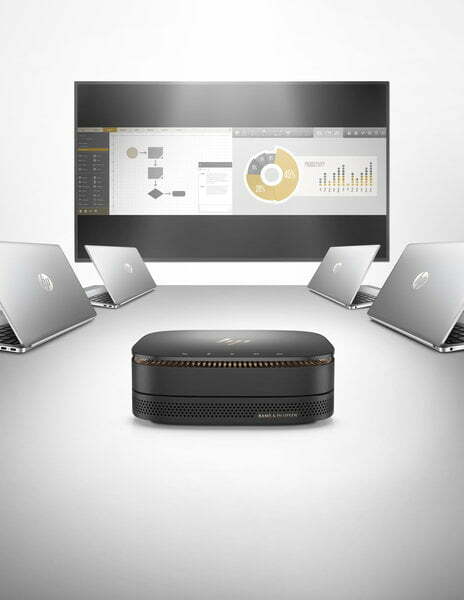 HP Elite Slice for Meeting rooms and conferences is nothing but a combination of the HP Elite Slice, HP Collaboration Cover, HP Audio Module and the Intel Unite software. This product collection is aimed to provide the best possible meeting solutions for businesses. All this can be used with a new HP LD5511 which is a 55-inch display format that will work with viewing angles up to 178-degrees. It has a resolution of 1920 x 1080 pixels which is great. This is a great display solution for up to 12 people in a meeting. The HP Elite Slice for Meeting Rooms will start at a price tag of $949 and it will be made available starting September 2016. The HP LD5511 55-inch Large Format Display will start at a price tag of $999 and the availability is same as HP Elite Slice.